REFRESH the page in your browser if you have been here before, or you may be seeing a previous version. 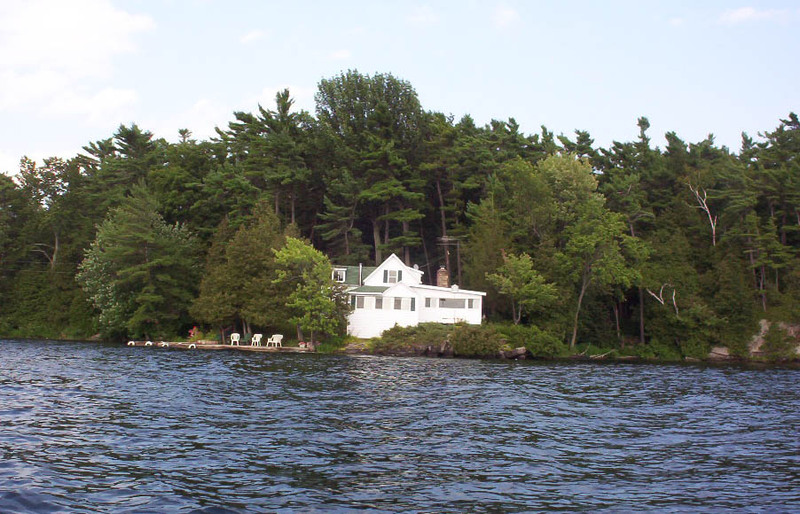 NOTE: Cottage owners reserve the right to change or remove facilities listed at any time without notice; while malfunctions during your stay will be tended-to asap, no refunds will be given for acts of nature, or anything other than basic necessities that. 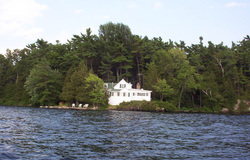 We are agent only for all rentals contracted on behalf of cottage owners and shall not be held responsible for changes made by owner; or website listing at any time. No refunds for amenities changes or acts of natural causes. 14' Fishing Boat, 9.9 HP Engine Included in one-week rental!! 2017 - New bathroom, screened-in porch, deck and more. Description: Sleeps 1-6, or 8 using couches ; log-type cabin on 2-3 acre island with no other cottages, is located just behind the Fisherman's Monument (one bedroom with double bed; loft bedroom has double bed and bunk bed (single size mattresses). It's about 2 miles by water from the main dock and public boat launch in Charleston Village, where you would park your vehicle(s). This cabin is the only cabin on the island, very private, but with boats going by. PLEASE WAVE - Canadians are very friendly! There are hiking trails, but not for bicycles. There is NO BRIDGE to this island (or ANY of our islands); you must get there by boat. There is a huge new dock and boat slip, great for jump-in swimming and sunning. There is a beautiful lake view from the cottage and outdoor chair & hammock area with fire pit, regulation horseshoes, canoe. ﻿NO TV, Wifi or Internet; use your imagination, enjoy your natural surroundings on this beautiful lake! PAY BY CANADIAN CASH ONLY UPON CHECK-IN AT KELSEY'S MARINA; Return key to Marina upon check-out. Linens not included. Please bring your own bedding, towels, washcloths, etc. Blankets and pillows are provided. 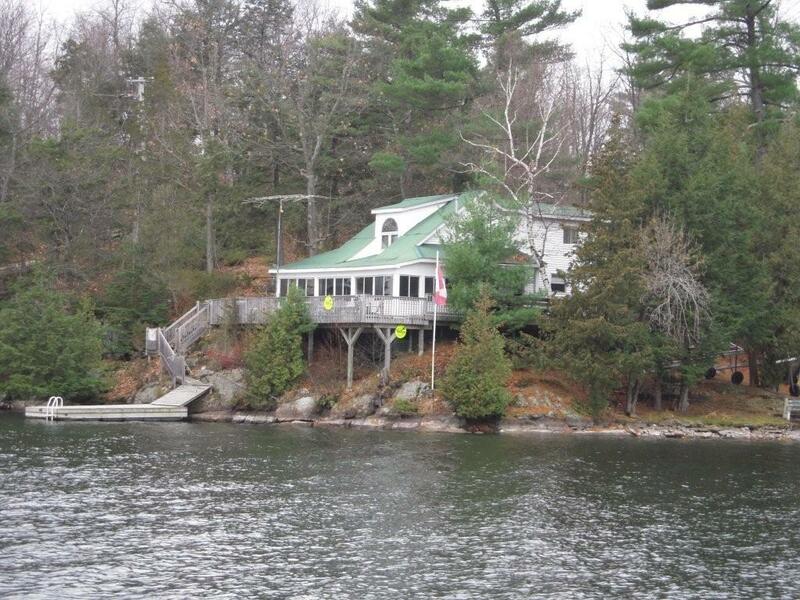 8Description: Sleeps 1-4 or 5 each; This photo shows boathouse and dock area. Side-by-side housekeeping cottages, each with 3 piece bath! Amenities virtually the same in each cottage; stove, fridge, microwave, coffee pot, toaster, blue-water bottle dispenser, sofa-bed, gas BBQ grill, TV, air cond. One bedroom has double; other has bunk (single size mattresses). Fish-cleaning hut by water/docks for our fishermen friends! Parking beside one cottage and directly across road, on lakeside of property. Docking for up to 4 bass boats; with electric by water. Wade or jump-in swimming, no "beach" per se. Sand Bay County Park is 5 minute drive with beautiful sandy beach, picnic tables, charcoal grills and restroom building. Great place for family outings! (linens not included for these cottages). Sleeps 1-4; 2 bedroom cottage (2 full beds each) with full sofa bed in living room, 3-piece bath, blue bottle water dispenser. Just about one mile from the Charleston Village main dock and Kelsey's Marina, 4 acres, including point with lighthouse and floating dock in sheltered bay with views of Charleston Village. Very private. The main floor has large kitchen, eat-in enclosed porch with sitting areas that boast gorgeous views of Blue Mt, Fisherman's Monument, Loon Bay sunsets and more. Large living room with couch and extra daybed, fireplace made from rocks off the lake, TV, CD player, lots of reading material and games. Washer/dryer and 4-piece bathroom on main floor, by rear entrance. Master bedroom (queen bed) is just off kitchen on main floor, sports a TV and window air conditioner, closet and 3 dressers. Upstairs has bedroom with double bed/dresser, loft bedroom with single bed, back bedroom with two single beds, dresser. Great HUGE cement dock, with tables/chairs for entertaining. Propane BBQ just outside back door, blue-jug water dispenser, stove, fridge, microwave, coffeepot, toaster, toaster oven and all dishes, cutlery and cooking utensils. Pellet Stove and more.... (Note: out-buildings not available to renters). Description: Sleeps 1-8, Main cottage sleeps 6, with room to sleep 2 additional in the two rooms above boathouse. 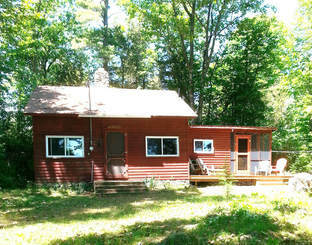 Cottage is on 6 acres of land, so there is lots of room for taking relaxing walks in the woods to enjoy the wildlife. It has a fantastic view of the lake, with weed-free swimming. Cottage has large beautiful new deck for BBQ'ing, relaxing and enjoying those spectacular sunrises. Lovely glassed/screened-in front sunroom which overlooks the front deck/water. Boat house has its own deck and diving board with room for one boat in boathouse. Dock is a floating dock with swim ladder, water depth at end of dock is 40ft. No wade-in area. There is plenty of parking on property. Description: Sleeps 1-12; great for two small families. Located about five minutes driving time from Charleston Village (two minutes by water! ); about ten minutes to Athens. This cottage has everything; wade-in water and deep water areas for swimming; two large docks; one small boat lift, kayak and paddle boat, as well as huge wrap-around deck, Stainless BBQ, fire pit, stereo system, satellite TV, air conditioners in all bedrooms, lovely glass/screened family room that overlooks the front deck/great view of sunrises on Charleston Harbor. 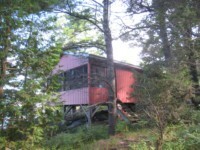 Fully equipped kitchen, two private bedrooms, one dorm room, and bunkhouse; parking for up to 4 vehicles. PAY BY CANADIAN CASH ONLY UPON CHECK-IN (not before 2:00 pm) AT KELSEY'S MARINA; Return key to Marina upon check-out (BY 10:00 am). All rentals for July and Aug are Sat to Sat. Weekends may be available during off-season months. Linens not included. Please bring your own bedding, towels, washcloths, etc. Blankets and pillows are provided. Please remove all of your own belongings, food, including condiments/fridge items. Please read the instructions regarding obligations of renters to leave places as clean as found upon check-in; as well as proper garbage removal.